The Ministry of External Affairs is organizing an open competition to design a logo that would best reflect the spirit of the PIO Parliamentary Conference which is being organized by the Government of India. PIO Parliamentary Conference will held on 9thJanuary, 2018 in New Delhi. With the Government reaching out to the Indian Community overseas, the first PIO-Parliamentary Conference will be an extremely significant occasion and platform to engage with our PIO Parliamentarians and elevate the relationship to a higher plane. 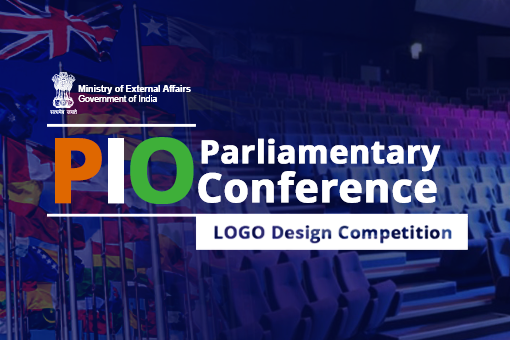 All interested Indians (resident and non-resident Indian citizens, as well as Overseas Citizens of India and Persons of Indian Origin) are invited to participate in the “Competition for Design” of a logo for PIO Parliamentary Conference. The logo should bring out the efforts of the Government reaching out to the Indian Community overseas and to engage with our PIO Parliamentarians and elevate the relationship to a higher plane. Last date of submission is 17th December, 2017, at midnight. File with the”.ai” extension or the “.eps” extension can also be provided. File should contain artwork that has been drawn in Illustrator, and not imported it. If the participant is unable to provide a file type that has been listed under the preferred/acceptable file types, we will make every effort to work with what has been provided but please be aware that the final printed result may be less than desirable. The final selected logo shall become the intellectual property of the Government of India and the designer shall not have any right over the same. The Government of India shall have the right to use, print or reproduce the prize winning logo in any form it deems fit.